Richard Kline, Barrister + solicitor. Calgary Canada . 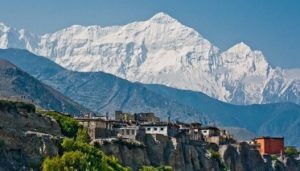 - BOUNDLESS HIMALAYAS TREKKING & EXPEDITION (P.) LTD.
Richard Kline, Barrister + solicitor. Calgary Canada . I have been most fortunate to have Ang as my guide and friend for the past 3 weeks on my trek of the Annapurna Circuit from Besisahar through Manang, over the Thorong Pass to Ghorepani, to Chomung and down to Pokhara. He was always very respectful and considerate of my feelings and desires. He is very knowledgeable about the trek, where to go, where to stay and eat and how long it will take . He was especially helpful to me when I suffered altitude sickness the day before we headed up to Thorong Pass. His experience in such matters allowed me to successfully complete this arduous trek without any further difficulty and to enjoy every moment of it with him. I highly recommend Ang Thile as a Himalayan Guide.